Plochmann Lane: Chris Bergson's "Imitate The Sun" ranked #2 blues album by "MOJO!" Chris Bergson's "Imitate The Sun" ranked #2 blues album by "MOJO!" 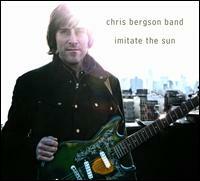 MOJO Magazine has just named the Chris Bergson Band's record Imitate the Sun the number two Blues Album of 2011. MOJO's list of the top ten blues albums of 2011, compiled by Tony Russell, appears in the January 2012 issue. Congratulations to all the winners! Chris Bergson also won Blues Revue's Sponsor the Bands Contest in the latest issue of the magazine, along with three other artists. "The ambience of Chris Bergson's music is an Edward Hopper world of suspicion and solitude, dusk-time avenues and dimly lit bars, its soundtrack a terse dialogue of guitar and saxophone. This is the terrain of Tom Waits and Lou Reed, and Bergson has something of each in his gruff, laconic delivery, but his sound is intransigently his own. Admirers of Fall Changes (it was MOJO Blues Album of the Year for 2008), hearing Goin' Home, Shattered Avenue, Mr. Jackson and the title track, will swiftly fall into step again... the album is riveting." "Chris Bergson writes memorable songs, sings them with passion, and plays such a mean guitar that the great Hubert Sumlin has been known to sit in at his gigs. Once again, he has gathered the best musicians in New York state to assist, the funky rhythm section of Matt Clohesy on bass and Tony Leone on drums, keyboard master Bruce Katz, and cool Jay Collins on sax, and each of them contributes moments of brilliance."